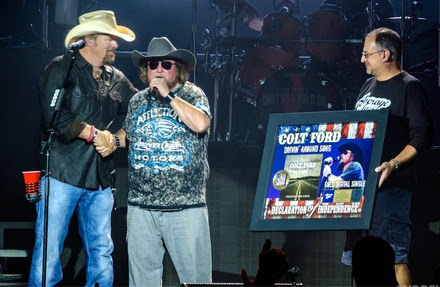 Average Joes Entertainment’s Colt Ford was surprised on stage at a show in New Jersey this past weekend with an official plaque commemorating the gold certification from the RIAA for the #1 single, “Drivin’ Around Song,” featuring Jason Aldean. Ford is currently on Toby Keith’s “Shut Up and Hold On” tour and he was surprised on stage by Keith himself and the VP Marketing and Promotions at Average Joes Entertainment, Tony Morreale. Thanks For Listening, Ford’s fifth studio album was released on July 1 and debuted at #1 on Billboard‘s Independent Albums chart, #2 on Billboard‘s Top Country Albums chart. Ford has also penned two other No. 1 songs, Jason Aldean’s “Dirt Road Anthem,” and Brantley Gilbert’s, “Country Must Be Country Wide.” He has sold over 1 million albums, millions more song downloads, has 1.5 million Facebook fans and over 100 million YouTube views.